NXP®'s software for Apple Carplay provides a complete software solution for auto infotainment systems based on i.MX application processors. 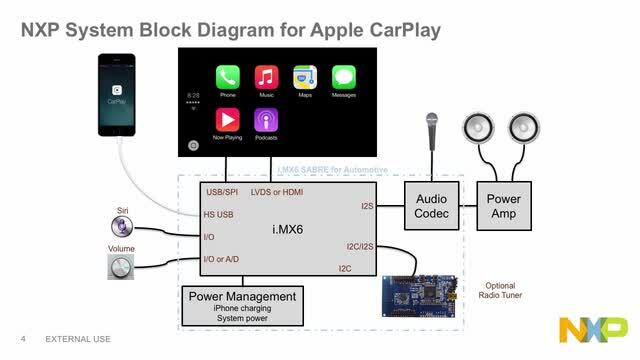 This software provides a smarter way to use an iPhone or other iOS devices in the car, including systems targeted for OEM and after-market systems. Support for up to 1080P 60 FPS resolutions. Capture of user input from touch screen or hardware buttons and provide to iPhone. Input management and control (touch screen, buttons, dials, D pad). Manage audio streams, instructions and calls from iPhone, audio entertainment from iPhone, radio tuner or other sources. Voice input for Siri and phone calls. Management of the USB connection.